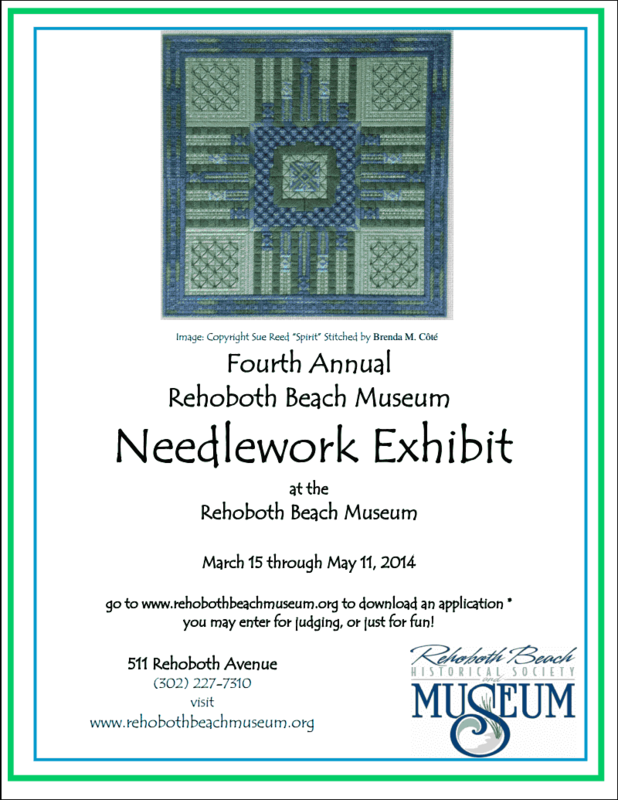 January 2, 2014--The information packet with application form for the 4th Annual Rehoboth Beach Museum Needlework Exhibit is now on their website. This is a fun exhibit to participate in as well as visit. And a great excuse for Rehoboth Beach vacationers to arrive early in 2014 to catch this event. November 19, 2013--The Rehoboth Beach Museum is announcing its 4th Annual Needlework Exhibit in Rehoboth Beach, Delaware from March 15 to May 11, 2014. I was so happy to see that Spirit by Sue Reed was chosen for their marketing piece (picture above) and Sue Reed was kind enough to approve the use of this project for their flyer. This sounds wonderful! I went to the museum's site to download the application, but there was nothing on there about this yet. Sigh. I'll never remember to check again. Hi Sara. I'll blog about this again in a few months when the website has the application form in place. Hope you'll participate--it's a fun exhibit.